Parakeets, or budgies, are popular pets thanks to their social nature and their ability to mimic human speech and other sounds. Due to their smaller size, they are a good choice for new bird owners. The cost of a parakeet will vary depending on where you purchase the bird. According to the FeatherMe website, a parakeet will typically cost between $10 to $60. The ASPCA estimates that you will spend approximately $75 on an appropriate cage. Cages should be at least 18 inches wide, long and tall, but the more room your parakeet has the better. The bars should no more than a half-inch apart so the bird cannot get his head stuck between the bars. Make sure the cage is rectangular or square -- parakeets will use the corners for a sense of safety. Wild parakeets thrive on a seed-based diet. In captivity, you can supplement the seeds with pellets, fruits, vegetables and pasta. If you decide to feed only seeds, supplement your parakeet's diet with a mineral block and multivitamin supplement. According to the ASPCA, food for your bird will cost about $75 per year. Parakeets are playful birds, so make sure the cage has perches with different textures and a variety of toys that you can rotate through so the bird stays interested. Some ideas for toys include indestructible plastic toys, toys the parakeet can shred, push-and-pull toys and hanging toys for perches. You can expect to spend another $30 per year on toys and treats, according to the ASPCA. Parakeets are very social; they need a lot of stimulation, so many people choose to get more than one bird. If you only have one bird, be prepared to spend as many as four hours per day with your bird. 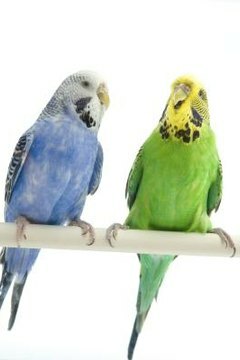 PetPlace.com says average annual veterinary expenses for a parakeet will be between $100 to $200. Conditions common in parakeets include obesity, renal disease and viral diseases. Preventative care is critical for your parakeet to prohibit illness and disease that will otherwise cause your veterinary expenses to skyrocket. Find an avian veterinarian, who is more knowledgeable about the specific needs of birds than a small animal veterinarians specializing in dogs and cats.